Well, the fundamentals was on the Fed was right and expectations of US rate hikes got kicked out of the door, but the markets decided to continue to push the Greenback higher, mostly on the back of falling oil and commodity prices. 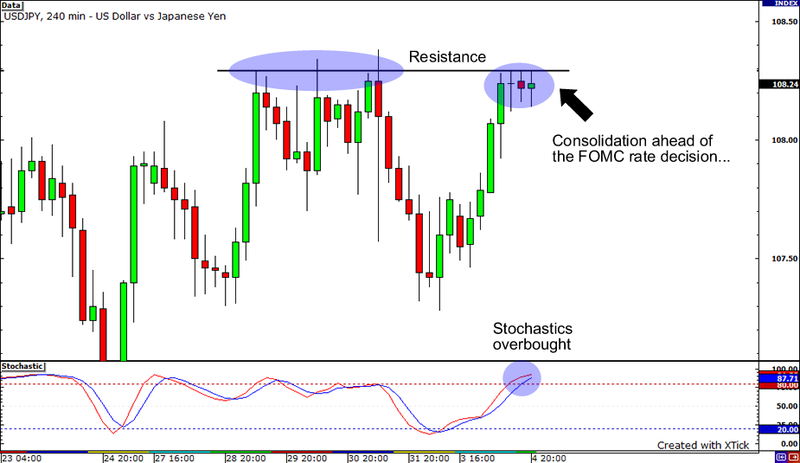 Our trade hit our stop as USD/JPY rallied higher. The removal of, “they appear to have diminished somewhat” indicates that the Fed will continue to focus on growth just a bit more than inflation for the time being. Also, many analysts were expecting three dissenters, but we only saw one as the vote came in 10-1 to hold rates. Our trade was triggered and made a low of about 107.70 before today’s major data, but it looks like buyers are still in control – especially after a drop lower was quickly stopped and reversed. Also, movements in the Greenback are also influenced by falling oil prices, pushing the currency up against the many of the majors. I’m just going to ride it out for now to see how the markets react in the upcoming European and US trading sessions. I’m going to leave my stop in place just incase we see momentum take the pair higher. No adjustments for now, good luck and good trading! What is up! With the FOMC interest rate decision coming up later today, there is quite a bit to think about, so I thought I’d just share what I see and what I think may play out later today. Be prepared. This is a long one… Ha! Of course, the big question for the Fed is “where is the focus – Inflation vs. Growth?” First, inflation has rocketed higher this year with CPI in the US clocking in at 5.0% at an annual pace. No surprise as the rise in demand for commodities over recent years has pushed prices to never before seen levels, pushing prices up in everything. 5.0% is pretty high, so the Fed should raise rates to stabilize prices and bring down inflation, right? Well, the economy is hurting, too! Let’s go down the list: failing housing market, rising unemployment rates (hitting 4 year highs), and a US financial system in turmoil where the government has to step in and provide funds to prevent systemic failure (and adding a whole lot to government debt in the process). Now, we saw a spike up in growth, probably due to the tax rebates back in the spring, but that has come and gone… so what now? Well, here’s my humble opinion on it all: I think the Fed will continue to focus on economic growth and jobs by not raising rates to fight inflation – for now. I think high inflation has affected everyone enough to slow demand and bring commodity prices down (commodity indices have fallen since making highs at the beginning of July). This gives the Fed a little bit of breathing room on inflation concerns as stuff like food and energy get a bit cheaper. Besides, if people keep losing jobs, then how will they be able to buy anything at all, like homes, food, gas, etc??? I vote the Fed saves the economy first, then fight inflation. This brings us to USD/JPY. While the expectations in the markets are that the FOMC will hold, the pair has rallied on expectations the Fed will raise rates by the end of this year. If I am correct in my “personal views,” then we may not see a rate hike from the Fed until next year. If the Fed doesn’t come out hawkish on inflation, it will signal no rate cuts and the US Dollar may fall. Remember to never risk more than 1% of your account on any single trade. Adjust position sizes accordingly. Stay tuned for adjustments and updates as I may make changes ahead of US data later. Good luck and good trading! Don’t forget to check out Forex news at Freshpips.com! !